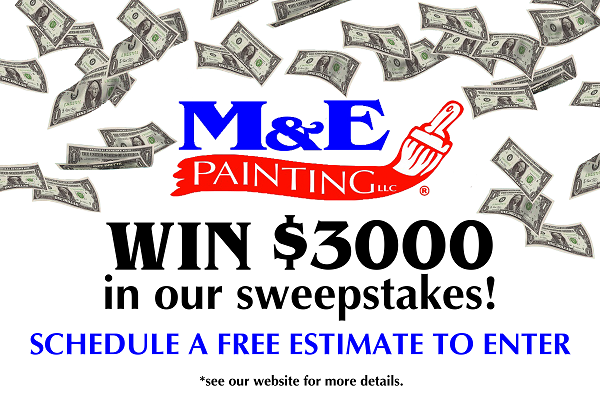 M&E Painting is offering one lucky person the chance to win $3000. You simply need to get an estimate between October 1, 2017 and March 15, 2018 to enter the sweepstakes. Book your free estimate today for your chance to win! No purchase necessary. Must be issued an estimate to win. Sweepstakes ends March 15, 2018. Must be 18 years old or older to enter. The house entered must be in M&E Painting’s service area, Northern Colorado. Only one entry per household. Employees of M&E Painting their respective affiliates, subsidiaries, advertising and promotion agencies, suppliers and their immediate family members and/or those living in the same household of each are not eligible to participate in the Sweepstakes. The odds of winning depend on the number of entries. Prize is a $3000 check issued to the winner that can be used towards the payment of their bills or mortgage. Check must be cashed within 60 days of receipt.